EOTW : The Czechs can relate to Israel — they were sold out by the European powers in 1938. 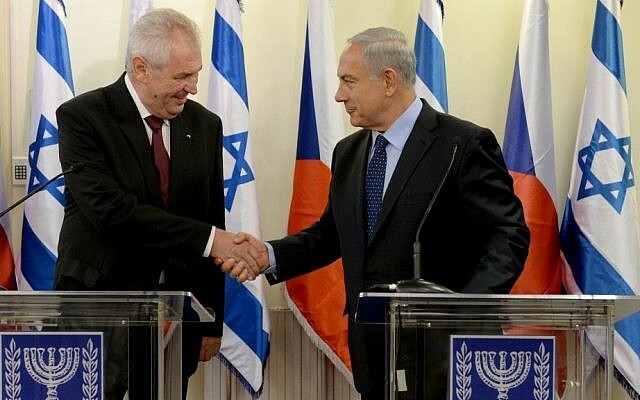 (AFP) Czech President Milos Zeman on Saturday accused EU states of being “cowards” in their response to his US counterpart Donald Trump recognizing Jerusalem as Israel’s capital. “The European Union, cowards, are doing all they can so a pro-Palestinian terrorist movement can have supremacy over a pro-Israeli movement,” said Zeman, presenting himself as a defender of Israel. The 73-year-old Zeman, targeting a second term from January and who had Friday said he was happy at Trump’s controversial move, made Saturday’s comment before delegates attending the congress of the far-right Freedom and Direct Democracy party, which opposes immigration and the EU. In a Wednesday address from the White House, Trump defied worldwide warnings and insisted that after repeated failures to achieve peace a new approach was long overdue, describing his decision to recognize Jerusalem as the seat of Israel’s government as merely based on reality. The move was hailed by Prime Minister Benjamin Netanyahu and by leaders across much of the Israeli political spectrum. Trump stressed that he was not specifying the boundaries of Israeli sovereignty in the city, and called for no change in the status quo at the city’s holy sites. Mogherini added that “the aspirations of both parties must be fulfilled and a way must be found through negotiations to resolve the status of Jerusalem as the future capital of both states.